Inta Audio has strengthened its web presence. PRESS RELEASE: Inta Audio, the UK's leading manufacturer of Music PCs and supplier of pro audio equipment, has announced the launch of its brand new website. Thanks to the easy to use 3 step PC configurator with just a few simple clicks you can not only customize your music PC online but you can also add all the essential studio equipment to build your very own dream studio. 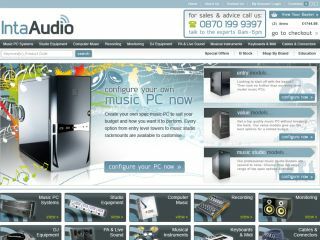 With nearly 10 years experience of building computers for the music industry Inta Audio offer a friendly service and are able to cater for your every need.